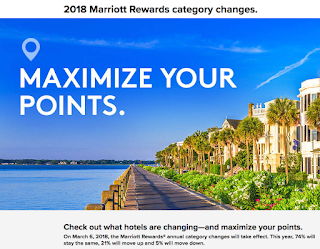 Earlier today we brought you the details on the Starwood Preferred Guest hotel category changes and as mentioned we'd bring you the Marriott Rewards category changes as well! The news, well changes from Marriott is worse than we saw with SPG. 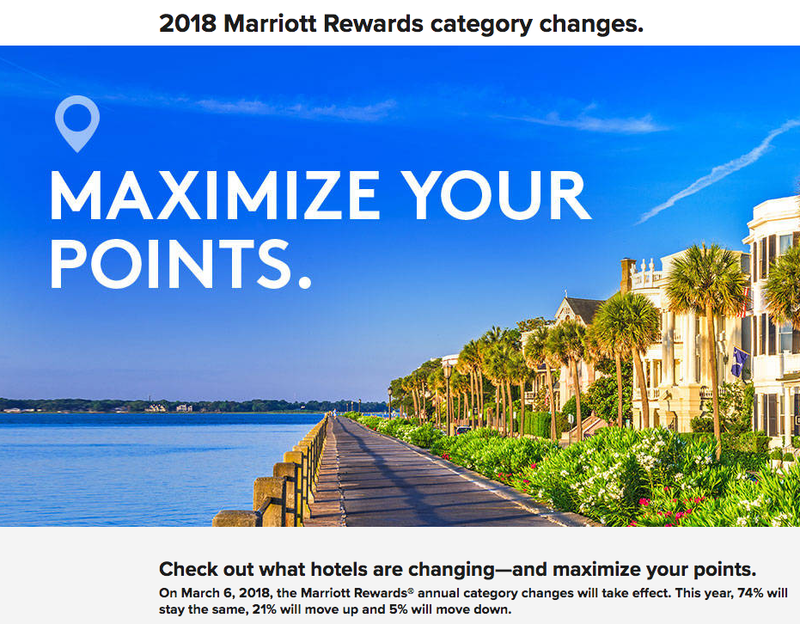 As of March 6th a total of 1,331 Marriott hotels will be changing categories. Of those, 1,083 are moving up while only 248 are moving down in categories. Of all the Marriott hotels globally the hotels increasing represents 21% of their entire portfolio while those going down only represents 5%. Overall this can be seen as a devaluation as nearly a quarter of their hotels now require more points or higher category free night certificates. Here in Canada, the changes in Canada affect approximately 42% of their entire portfolio here with 46 hotels going up in category (roughly 30% of their hotels in Canada) but surprisingly only 5 are moving from Category 5 to 6. Granted there are only 19 Category 5 hotels in Canada currently so this a quarter of them. But why is this a surprise? There is going to be an influx of people who will be receiving Cat 1-5 certificates from the end of the Chase Marriott Premier Visa Card on March 15th which means that many more free nights to be used at those hotels. Not all to be used in Canada but I gather a large proportion are redeemed within our borders. Overall with these changes it will leave us with roughly 100 hotels in Canada where you can use that certificate. On the flip side, 18 hotels are going down in Category. (represents about 12% of hotels in Canada) Of note The Hotel Saskatchewan goes down to Category 3 which makes it a really good deal. I'm also glad to see the Delta Hotels Kananaskis Lodge go down a category although in my opinion Category 6 is still high for the quality of this hotel. You really are paying for the location in the mountains. As is always the case with these annual category changes we recommend trying to book before March 6th if you have had your eyes on a redemption at any of the locations moving up a category and if at all possible wait to book for a free night if that location is going down. You can find the complete list of the hotels changing categories here.